Laser projection keyboard lets you type on flat surfaces! Laser projection virtual keyboard transforms flat surfaces. Our virtual keyboard transforms a flat surface into an instant work station. So you can type up a storm any time you want. Put the future at your fingertips with our virtual laser keyboard. NEW! Green laser projection keyboard is even brighter! Inside advanced optics are hard at work tracking your fingers like magic. Because it is Bluetooth enabled, the laser projection keyboard pairs quickly and easily with tablets, smartphones and most laptops. Comes with a USB cord for easy recharging. Lasts for up to two hours of continuous typing. 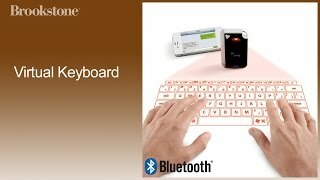 Order your Virtual Laser Projection Keyboard from Brookstone today. The Bluetooth® word mark and logos are registered trademarks owned by Bluetooth SIG, Inc. and any use of such marks by Brookstone is under license.